This is a very popular vintage Skipper ensemble. While the dress is fairly easy to find, all of the little accessories can create a challenge. This is one of those ensembles where if you want it complete you will probably be better off to buy it complete rather than to try to piece it together. 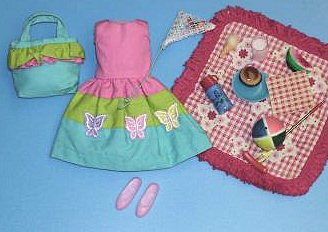 The tiny thermos top and the paper butterfly are especially hard to find. The sleeveless dress has a hot pink bodice and a full skirt. The skirt has pink, green and blue ruffles with embroidered butterflies in purple, pink and yellow. The matching tote bag is blue with a green and a pink ruffles. 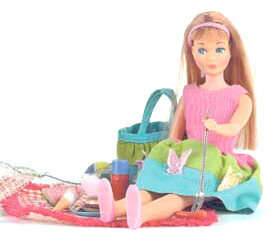 The bag will hold Skipper's many accessories for her picnic.